Another of my interests (and has been since the mid 1970’s) is volunteering for Comms at car rallies. These are the type of car rallies that are generally conducted on dirt roads in pine forests and where there is a need for a navigator wearing a helmet resplendent with intercom which he uses to yell at a similarly dressed driver what the next few hundred metres has in store for them as they drive at break neck speeds such that us ordinary folk would only dream of driving on tarred roads which are dead straight and more akin to an Airbus runway. How some of them manage to make it out alive beats me but it is a very exciting spectator sport. My interest comes watching them either starting or finishing or flying past and then relaying that information back to HQ via ham radio. These spots are generally at least as exciting as the designated spectator points with the added bonus that you are up close and personal with the cars, drivers and navigators. I have had the honour of seeing some of the Australia’s best rally drivers and their cars from these very spots – people including the late but great Possum Bourne. By having radio communication at the starts and finishes as well as SOS points along the way it provides a great safety aspect as often there is little or no phone coverage in these forests. With our input the rally organisers know where each car is or at least should be at any point in time and can of course score the cars the moment they arrive at the end but more importantly quickly do something about it if a car fails to show up at a particular point. Sadly, the car club in Wagga no longer seems to conduct them and one has to go to Canberra if one wishes to follow this pursuit further and I do from time to time. I like to think that as a bit of a compromise seemingly for me at least, the Brindabella Motor Sports Club has seen fit to conduct a rally up in Bondo State Forest off the Tumut – Canberra road for the last two years so it is quite close to us here in Wagga. It probably has more to do with a great venue rather than a favour to me though. Last year it clashed with something else and I couldn’t attend. It’s also a bit of a money spinner for our radio club as the Canberra guys share their donation with us. Now, the comms infrastructure for the event just happens to be on Mt Tumorrama and that, as it turns out, is a SOTA summit and I knew if I played my cards properly I could kill two birds with one stone. (I suppose you were wondering when SOTA was going to get a mention.) 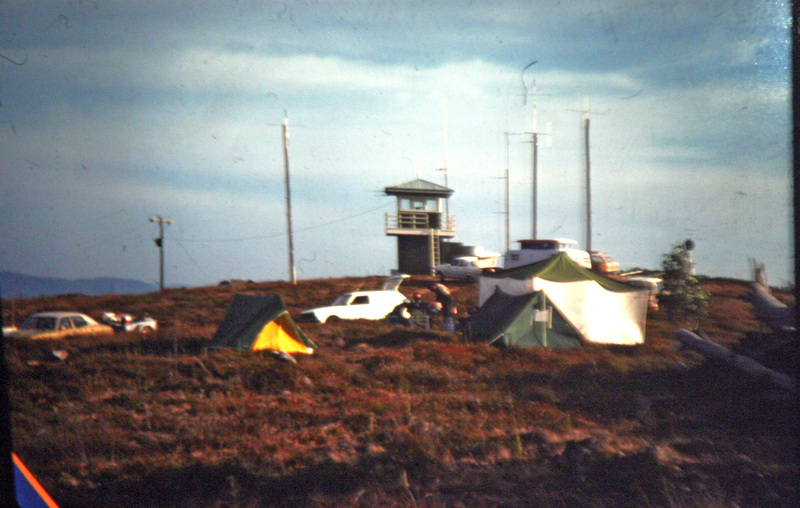 As it worked out I was able to help Rod VK2TRB and the Canberra WICEN boys erect the antennas on the fire tower on the Friday and fortuitously just managed to sneak off in a quiet moment to recce the summit for a suitable operating spot in the activation zone but well away from the tower. 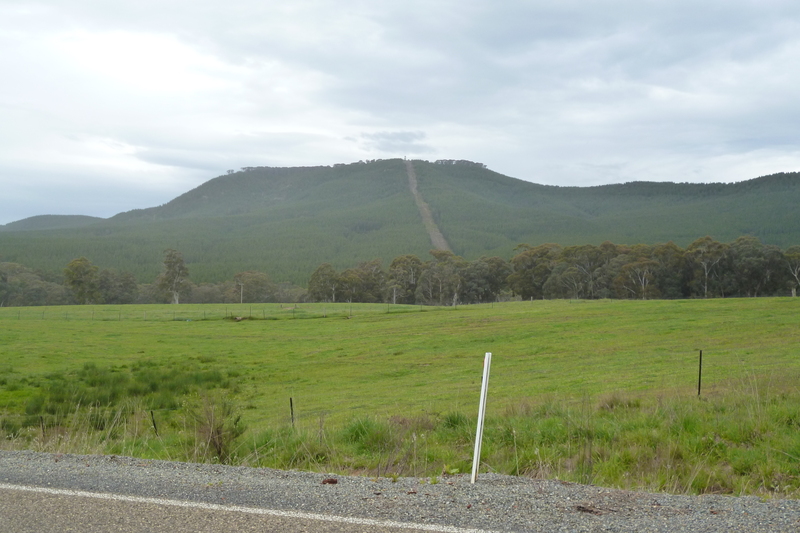 Mt Tumorrama is an 8 pointer for SOTA and it rises up out on the western edges of the Brindabella ranges to a height of some 1200m ASL. The views from there are something else – especially at sunset. The dust from the rally could be seen also hanging in the air along the tracks like a long brown snake and from up there looked really interesting. Did I mention I like the views from the tops of these hills? Earlier in the week I wondered whether my middle grandson, John (9 – he says he’s nearly 10) might enjoy the outing. His older brother certainly did at the same age and encouraged him to go. As it turned out he was quite excited by the prospect although I am sure he really had no concept of what actually lay ahead. Even seeing Mt Tumorrama off in the distance excited him …he’d never seen a hill quite that big before. I figured a 90 minute SOTA activation would be plenty and timed our arrival for about 10am. I parked just short of the summit and we set off down toward the northern end – me loaded down with the pack and squid pole while John loaded himself down with my Samsung 10 inch tablet (for spotting) :). He did start off carrying the squid pole but as it is almost as high as him it kept dragging on the ground so I ended up carrying it. OK, so when he’s bigger I will give him something more to carry. I found a suitable clearing and we set up. First thing I found was there was no 3G coverage so spotting would have to come from someone else. Anyway, John and I soon had the station set up and put out the first call and then listened…and listened. Nothing! I tuned around and could just faintly hear Craig VK2PAW/p on HU-080 up in the Hunter region somewhere. At least I might get a summit to summit. We exchanged a 5×1 each and then that was it until I managed to work Matt VK1MA/p nearly 25 minutes later. In the meantime I even tried 30metres without success. Matt was 5×9 but then so he should have been – he was portable down at Rally HQ at the bottom of the hill! By now Rod VK2TRB had come for a run up to see what this SOTA stuff was all about and after pottering around on the hill for awhile he finally found us. I think he came away amazed at how simple the set up was…pity conditions weren’t better…if they were I am sure he would have been more impressed. Perhaps he will join me again for another activation …perhaps that Mt Jingellic summit eh Rod? By now I was starting to get a bit concerned that I might not even get the activation points. You need 4 contacts for that. Conditions on 40 were lousy to say the least. I could only hear a few very weak stations. 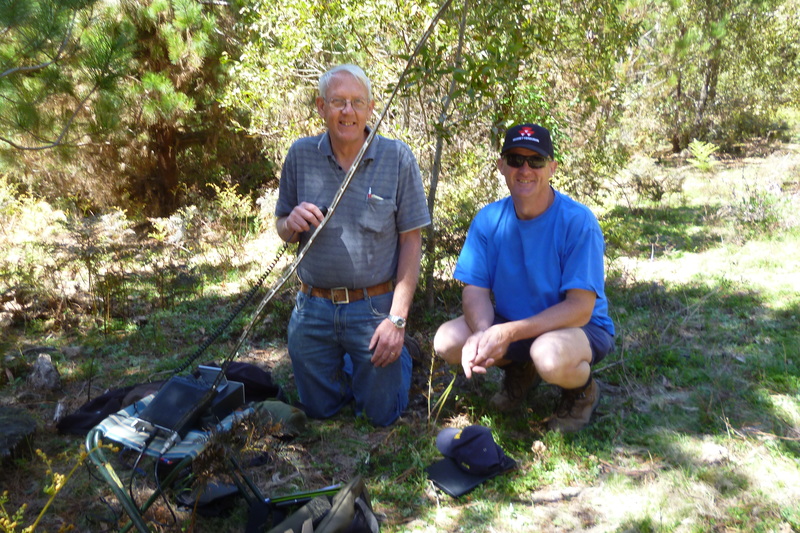 It wasn’t until after the UTC rollover that my next contact came and that was a very weak contact into Tony VK3CTM down Melbourne way who was also having trouble working another VK3 SOTA station so at least it wasn’t just me or my gear. I managed to break in to Tony’s QSO telling him the other station was hearing him but just needed the signal report. Not sure they completed the contact in the end but at least I got my signal report from him. I managed another 4 contacts and they came quite quickly but not until after a further 20 minutes had elapsed …and by now I was fast running out of time. I really needed to get off the hill and down to the meet point for the rally. Those next few contacts were from Matt VK1MA/p again down at the rally followed by Glenn VK3YY, Matt VK2DAG and Ed (VK2JI) operating his club station of VK2AFY. He offered to spot me but by then we really needed to pack up and head off so I declined. Rod helped us pack up the station up and we set off. Given the time span and the seven contacts made I don’t think young John was totally impressed with this SOTA thing. I hoped the next part of the day would be more to his liking. Well, I am happy to report that he was blown away by this car rally stuff, especially when the first car, a 5 litre V8 Commodore showered us in stones and dust as it thundered off down the track from the start position. You couldn’t wipe the grin off his face! That set the scene for him for the next hour or so. He happily settled in and between snacks wrote the car number and start time down for me while I radioed the info back to HQ.. I told him that what he was doing was called logging. He also had lessons in UTC and 24 hour time or ‘hundred hour’ time as one of the marshalls called it. Our start marshalls were also most entertaining – two ‘local boys’ from in and around the area. Reminded me a bit of the Doon boys from Tumut years ago….if you know the area, you will understand what I mean. Anyway they spoilt John a bit giving him food snacks and drinks…not that I didn’t have much for him to eat and drink 🙂 …he managed to polish off quite a lot that afternoon and certainly didn’t go hungry. They even engaged him in a stone throwing competition after our first stage was finished. It was an interesting afternoon to say the least. or perhaps he was looking for his hole as just as I was taking it he put his head down and disappeared down a hole on the edge of the road. 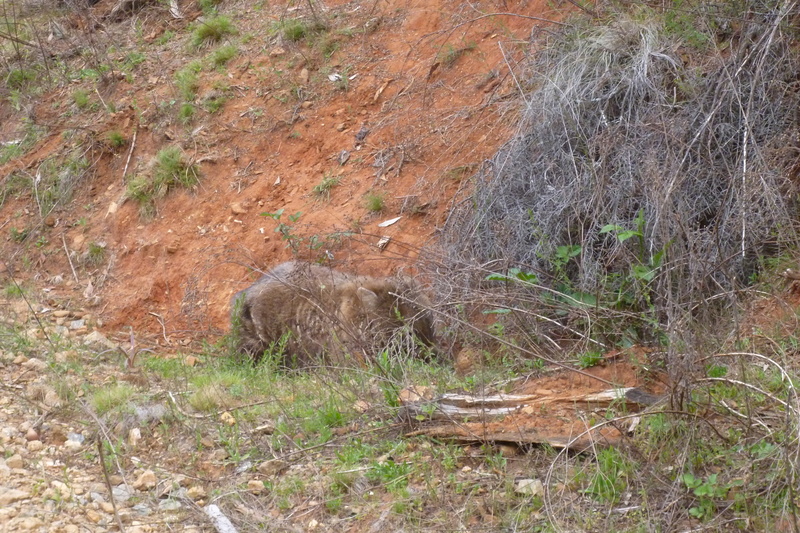 Mind you, I too was excited but that had more to do with the wombat staying out of the path of the car. 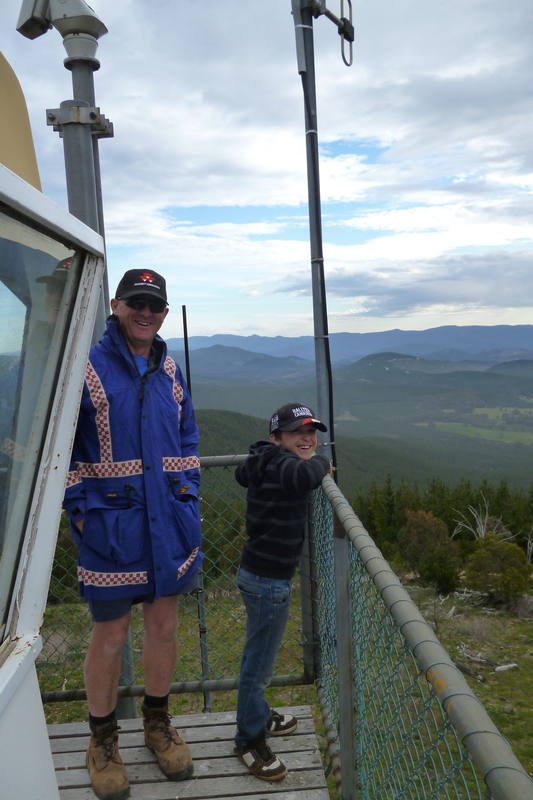 Following this bit of excitement young John started to pester me to climb the fire tower as it now come into view. Now, I can’t say I was exactly excited by this prospect but I gave in on the proviso he promised to stay just above me as we climbed up and down. The fire tower is about 20 something metres high with a rickety folding 3m aluminium ladder that’s normally locked at the bottom that leads into a caged set of steps going straight up. At the top is a walkway enclosed with netting to waist height all the way around a glass and fiberglass room from which a fire spotter sits for hours on end looking out for smoke and calling back the direction and distance for Forestry and or RFS to take care of. True to his promise John climbed just above me where, if he did fall, I could hopefully catch him …he never missed a step! Once up there he explored the fire control room deciding that the millions of dead lady beetles covering everything was not somewhere he liked being so he elected to stay outside on the walkway in the wind … at least long enough for a photo opportunity. However, as he soon discovered, the tower moves in high wind and it was really blowing a gale. So with discretion being the better part of valor he thought the ground might be a safer option in the long run and so off we went down, climbing the same way we came up, with me immediately below him. The day finished quite late for him (and me for that matter – not as young as I used to be 🙂 )but to his credit he stayed awake all the way home. Mind you, a big feed at Maccas in Tumut at around 8.30pm probably helped. Anyway we got back home just after 10pm that night. A great day and many thanks to the guys who made contact me with in the morning and allowed me to claim the points for the SOTA activation. 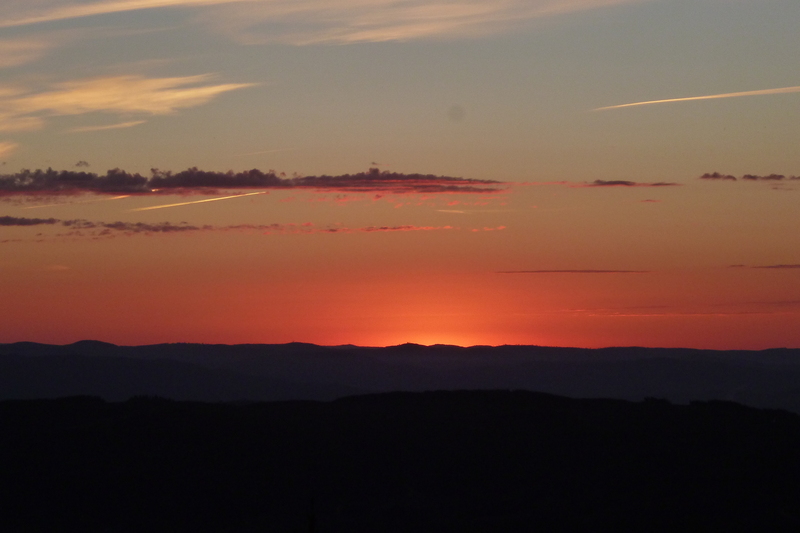 Might be a few more weeks to my next activation – I still have in mind that Mt Jingellic though. This entry was posted in Uncategorized on November 12, 2013 by vk2yw.